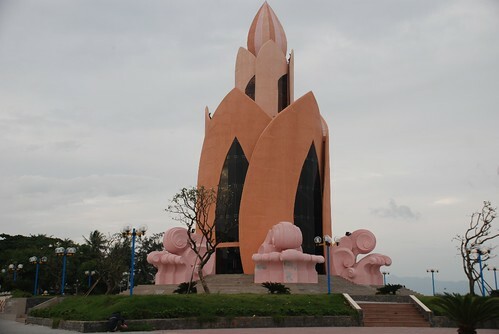 This is one of the ugliest monument I've ever seen in my life. 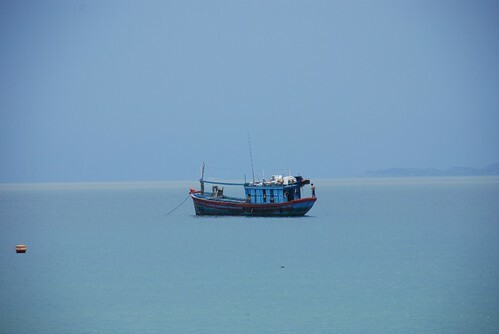 It's located in the best location in the beautiful city of Nha Trang. I wonder where all the best architects are? Tell me what do you think. I went back to Nha Trang earlier than usual this year to escape the damn Hanoi cold and to greet the beautiful sunshine in Nha Trang. I always enjoy the sun here at this time of the year as it's not very hot and quite dry. I can already feel the difference in my breathing and my hair even feels healthier. The quality of the air in Nha Trang is very clean compared to Hanoi and a welcome break from all of the traffic chaos and noise. I love coming back as I can visit my family, good friends and eat my favorite foods. My good friends from Hanoi are coming down this weekend and they will stay for a week for Tet. For some of them it is the first time and the rest of them not. For my closest friend, it is his sixth time! 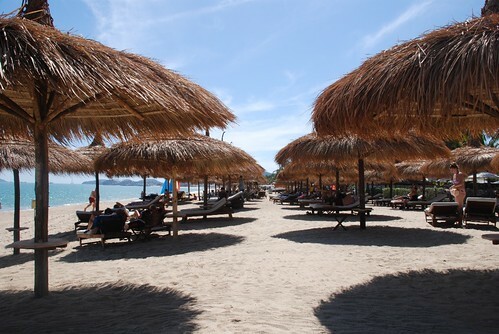 The main reason they come is to relax, lay on the beach, read and enjoy the seafood and streetfood. At some beaches in Vietnam, the vendors can be quite annoying but in Nha Trang they can be avoided. Well, I am off now to the beach now. On the way back from Greece, we stopped in Bangkok for a couple of days. After the long flight, I felt exhausted and took a nap in the hotel before having a bowl of Thai noodle soup from a lady on the street near the hotel. In my jet-lagged condition, I remember saying it was one of the best noodle soups I'd had. 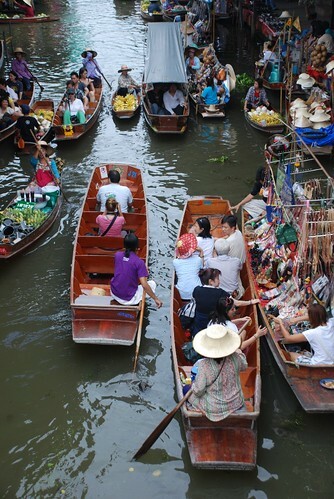 We started our new day in Bangkok by booking a floating market tour for the next day and going for a spot of shopping at the big plazas. We took the Skytrain and I immediately noticed how Thai people generally obey the rules for queuing and on the roads much better than we do in Vietnam. When we reached the Siam shopping centre food court, a funny coincidence occurred. 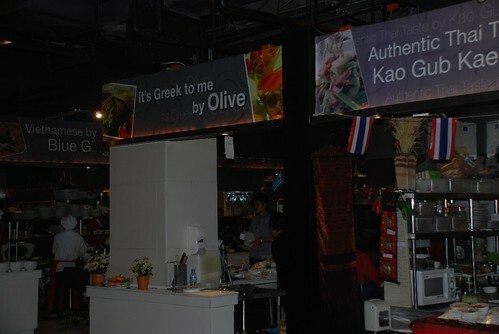 There I was, standing at the Thai food stand, which was next to the Vietnamese one on one side and the Greek one on the other. Pretty strange considering we were in Thailand after a trip to Greece but on the way to Hanoi, Vietnam! Bangkok is a big city, noisy, polluted and full of eye-opening sights, especially around the PatPong area! 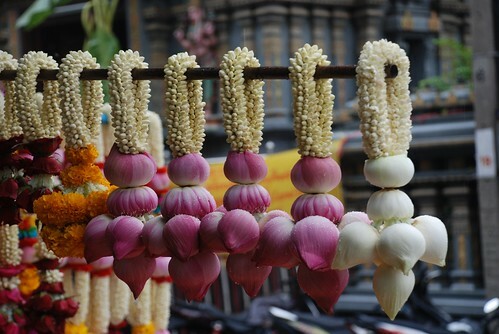 Of course, there are lots of things to see and do in Bangkok but it's just like any other big capital city in the world. What makes it unique is the sweet local people. An example of this is the kind old gentleman who acted as our tour guide to the floating market and the Royal Palace. 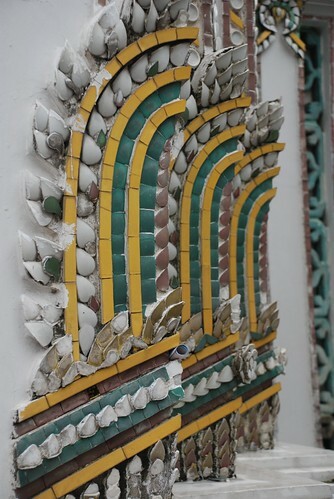 All in all, our two day stopover in Bangkok was a nice way to get used to the timezone. 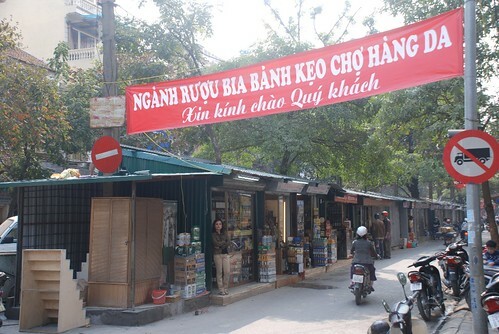 In the last few months, the local authorities have abruptly knocked down or closed quite a few of Hanoi’s wet markets. Prior to this, the movement to modernize the city’s markets had always seemed rather long term, something that might eventually happen. But now they are serious. The Old Quarter market in Hang Be Street has been halved in size, the large Hang Da market has been closed pending re-development and the famous 19/12 Hell Market was demolished overnight a couple of months ago. Western style shopping malls and supermarkets will start cropping up all over town in the next few years. So it looks like it’s goodbye to yet another part of traditional Vietnamese culture. As the city market scene changes shape, most of the stallholders have been relocated to temporary sheds along while construction takes place. Hundreds of tiny green sheds have further narrowed the streets or pavements of the old quarter, most noticeably along Phung Hung Street parallel to the train line. Many of the stalls actually have no frontage onto the street which makes merchandising their goods quite difficult. For many, I’m sure this situation has resulted in large reductions in their revenue. Most of the vendors are not happy and remain pessimistic about their capacity to afford the rent when the new premises re-open. The move has also affected consumers, many of whom are no longer within walking distance of their regular vendors. 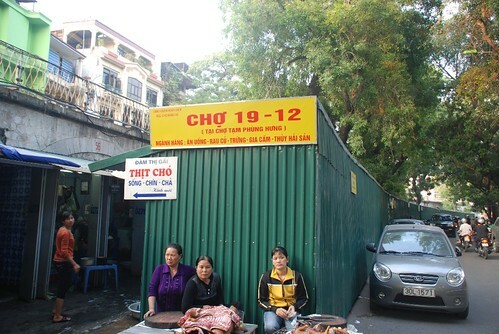 The 19/12 Hell Market stalls are now several kilometers away from their original location. No doubt one of the government’s objectives with these plans is to improve the hygiene and sanitation of Hanoi’s markets. Health scares raised in the media are often blamed on the conditions in wet markets. Presenting an image of modernization appears to be another reason for the redevelopment. Tall residential buildings and modern commercial buildings with glass facades are springing up all over town and I suppose the theory is that the rickety, temporary appearance of Hanoi’s wet markets is not in keeping with the vision for the city. This thinking is partly flawed. A modern market or supermarket does not automatically eradicate health fears. Shiny surfaces and lots of glass create an image of new and clean but the reality is that harmful bacteria can exist anywhere. Education about improved food handling practices and systematic cleaning is still required. Refrigeration is useful only if the food is stored correctly and the fridge is actually turned on. Finding some kind of compromise between the old and the new does not seem to be on the agenda. Would it be possible to modernize Hanoi’s markets without completely stripping them of their original character and atmosphere? Should going to the market be an experience where customers simply pick up what they want and pay for it with very little interaction? Do we want Hanoi to be transformed into another Singapore or Bangkok, where only pockets of traditional culture are visible amongst the concrete and glass? Is there a risk that Hanoi’s modernization will alienate tourists looking for diversity and difference? I don’t have the answers but I know what I think! 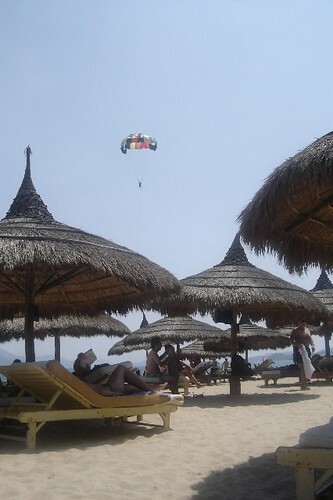 Nha Trang has long been a popular destination for both local and international tourists. Its long sandy beach lined with coconut palms is the stand out attraction of this large coastal city located on Vietnam’s south central coast. Entire days can quite easily be whiled away relaxing in the sun, chasing a tan, recovering from a hangover or simply de-stressing. 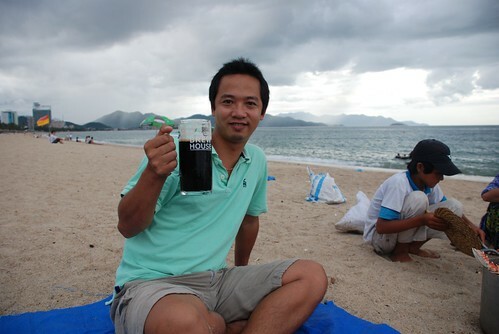 In fact, a beach city like Nha Trang can be a very therapeutic place. It is tourist friendly. In Hanoi, the tourist patch is the Old Quarter. In Saigon, it is district 1 and the strip along Pham Ngu Lao. In these areas, many of the local folk can speak English reasonably well. This makes information about tourist services, onward journeys and local places of interest easy to obtain. Nha Trang also has it’s traveler’s zone, where boat trips can be booked, motorbikes can be rented, flights and onward bus and train journeys arranged and all manner of western and international cuisine ordered and enjoyed. Located along and parallel to a few blocks of beachfront, the place to stay in Nha Trang is in the small district known as Biet Thu. Mini-hotels and guesthouses abound in this area and the beach is never more than a five minute walk away. More up-market accommodation in high rise hotels is available further up the beach road if you don’t mind a long walk or a taxi ride at the end of the night. 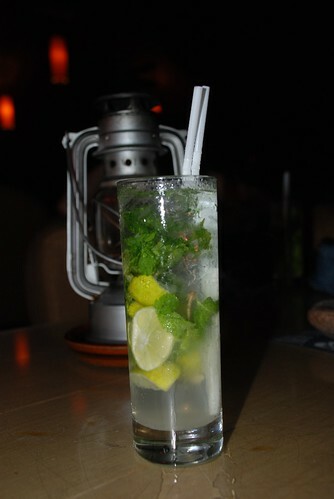 A night spent in one or more of Nha Trang’s great bars! The jewels in the crown of the bar scene here are the Nha Trang Sailing Club and the Louisiane Brew house, two long established watering holes right on the beach. The former is a stunning complex of restaurants, bar and nightclub, where drinks after a hard day on the beach can be followed by a meal and some jiving on the dance floor. For many, it is the last stop of the night. The latter is a beer lover’s paradise, open all day but not so late into the night. Four different beers are brewed on the premises and can be enjoyed on the brew house’s waterfront beach lounges or by the pool. Away from the beach, Crazy Kim’s, Guava, Shorty’s and the Why Not Bar all have their own unique atmospheres. 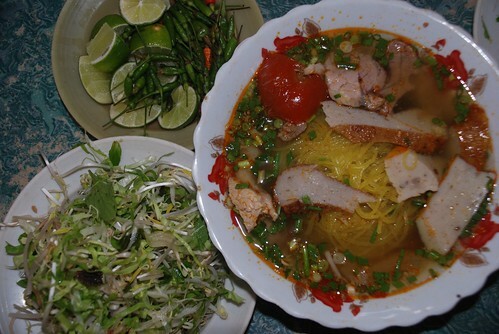 Eating options in Nha Trang are various. Indian, Italian, Japanese and other international cuisines are pretty well represented here. But, by the seaside, the choice is obvious. 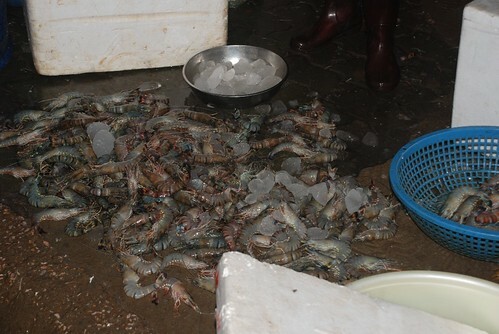 Prawns, squid, lobster and fish are on display outside restaurants throughout the tourist area. Customers can select exactly the creature they want to dine on and watch it flipped onto the barbeque. 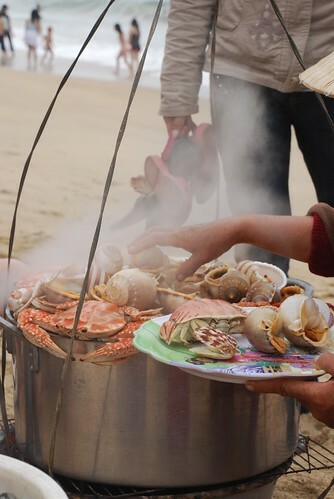 However, better seafood experiences can be had where the locals eat. 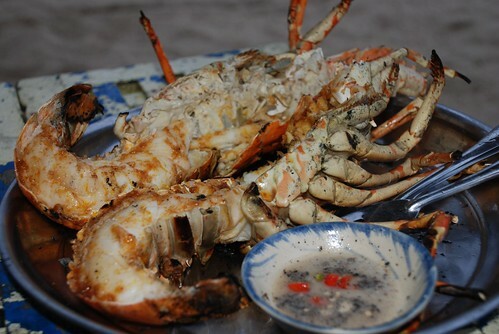 One such place is Bien Tien Hai San, a restaurant about three kilometers along the main beach road north of town. 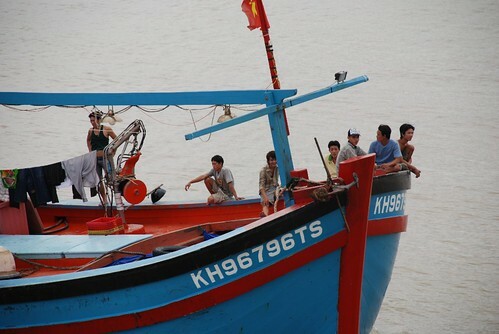 In fact, there are many seafood eateries out this way which are worth a visit. Other local specialties, available away from the tourist strip in the streets around the main market, include fried rice-flour pancakes (banh xeo), fish noodle soup (bun ca) and fresh roll-your-own spring rolls (nem nuong). Going hungry in Nha Trang is not even remotely possible. Apart from the above-mentioned sedentary activities of sunbathing, drinking and eating, Nha Trang does have a few more active pursuits on offer. Diving is big here, with a few operators competing for underwater business. All day boat trips to the surrounding islands, with frequent stops for swimming and snorkeling are also popular with the young backpacker crowd. The Cham Towers across the river are also worth a visit if history and architecture are of any interest. Despite all of the possibilities, whenever I go back to Nha Trang I find myself gravitating toward the beach by day, the street food and seafood at meal times and the bars by night. It’s a routine I thoroughly recommend!